Clouded leopards are two species of wild cat that live throughout the forests of Southeast Asia. The smallest of the big cats, they are secretive and rare in the wild, preferring to remain alone and hidden from view. Because of this, studying them is a unique challenge, and while we know much from watching cats in captivity, these two species of cat remain elusive and poorly understood. While all species of cats are closely related and classified as one family, the Felidae, genetic research has shown the clouded leopard to be more closely related to the large cat species than smaller cats. Thus, clouded leopards are considered a member of the Pantherinae - a subfamily of the Felidae family that also includes lions, tigers, jaguars, leopards, and snow leopards. While they are known as clouded leopards, cloudies are not directly related to normal leopards. Until 2006, there was thought to be a single clouded leopard species. However, recent genetic and morphological research has shown that there are two distinct species. 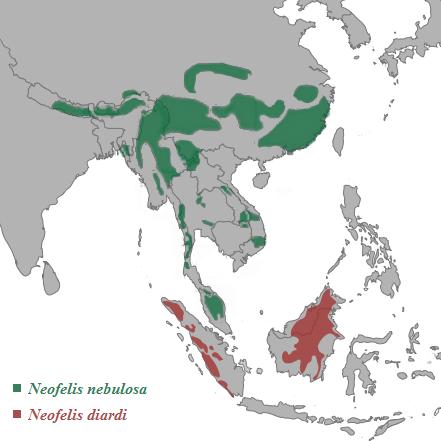 The cats on mainland Asia and Taiwan kept the traditional species name (Neofelis nebulosa) while the cats from Borneo and Sumatra took the name the Sunda clouded leopard (Neofelis diardi). Furthermore, this also changed the number of subspecies. All nebulosa subspecies have been combined into one group, while the diardi populations seem to be split into two subspecies: N. diardi borneensis on the island of Borneo and N. diardi diardi on Sumatra. With regards to appearance, the Sunda clouded leopard have smaller and darker cloud markings and a darker overall coat color. The majority of clouded leopard pictures are from mainland nebulosa individuals, meaning that photos of the Sunda clouded leopard are much more rare. 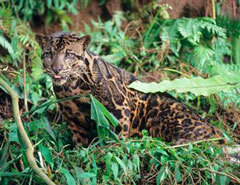 Wild Sunda clouded leopards were only first caught on video in early 2010. Clouded leopards primarily live in lowland tropical rainforests, but can also be found in dry woodlands and secondary forests. They have been spotted at elevations up to 9000 feet in the Himalayan mountains. Historically, their range covered most of Southeast Asia from Nepal and southern China through Thailand, Indonesia, and Borneo. However, this range has shrunk due to habitat destruction and human poaching. Clouded leopards are a medium-sized cat named for the cloud-like spots on its coat. These provide camouflage in the dappled light of its forest habitat. (In China the cat is known as the 'Mint Leopard' because its spots can also look like mint leaves). The cats usually stand 10-16 inches (25-40cm) tall and are 4 to 6 feet (1.2-1.8m) long, almost half of which is the tail. Males tend to be larger and weigh up to 50 pounds (23 kg), while females rank in at about 35 pounds (16 kg). Clouded leopards can live to about 17 years old in captivity. Fitting for an arboreal creature, clouded leopards are one of the best climbers in the cat family. They are able to climb upside down underneath tree branches, hang from branches with their hind feet, and even descend head first, like a squirrel. Several adaptations allow clouded leopards to achieve these amazing arboreal skills. Their legs are short and stout, providing leverage and a low center of gravity. Furthermore, a clouded leopard's extremely long tail provides an excellent balancing aid. For grip their large paws are armed with sharp claws and specialized padding that conforms to the shape of the branch4. The hind feet possess flexible ankle joints that allow the foot to rotate backwards as well. Another distinctive feature of the clouded leopard is its long canine teeth and unusual skull. The clouded leopard has the longest upper canine teeth for its skull size of any modern carnivore, causing some people to compare the cat with the extinct saber-toothed cat. In fact, studies by Dr. Per Christiansen of the Copenhagen's Zoological Museum have revealed connections between the two groups. 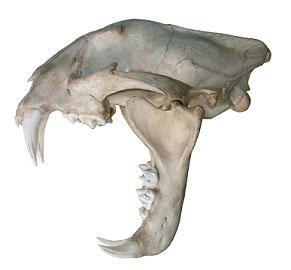 Dr. Christiansen's research into the skull characteristics of both living and extinct cats has revealed that that the structure of the clouded leopard skull bears distinctive resemblance to primitive saber-toothed cats such as Paramachairodus (before the group became highly specialized and developed enormous upper fangs ). Both saber toothed cats and clouded leopards have an enormous gape, around 100 degrees, and various adaptations to support such a gape. In contrast a modern lion can open its mouth about 65 degrees. This could indicate that one lineage of modern cats, of which now only the clouded leopard is still present, evolved some adaptations in common with the true saber-toothed cats. It also indicates that the clouded leopard may hunt large prey in the wild in a slightly different manner from other great cats. Saber-toothed cats would bite prey through the neck, using their elongated teeth to sever nerves and blood vessels and strangle the windpipe, which would instantly kill the prey. This was a very different hunting technique from living big cats, which use a throat or muzzle grip to suffocate the prey. It is possible that clouded leopards use a similar technique. 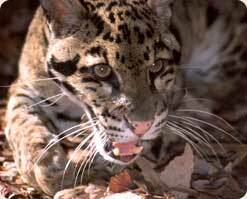 However, little is known about clouded leopard hunting strategies and no current evidence points to an unusual feeding ecology5. Like all wild cats, clouded leopards are carnivores. They are thought to hunt a variety of prey including birds, squirrels, monkeys, deer, and wild pigs. It was once thought that clouded leopards hunted while climbing. Current thought, however, is that while some hunting may occur in the trees, most takes place on the ground. Trees are thought to provide resting habitat for cloudeds during the day. Virtually nothing is known of the social behavior of wild clouded leopards. They are likely solitary, like most cats, unless associated with a mate while breeding or accompanied by cubs. Likewise, activity patterns are virtually unknown. Once thought to be exclusively nocturnal, evidence suggests that cloudeds may show some periods of activity during the day as well. It is known that they will patrol their territory (like all cats) and may use logging roads for hunting and travelling6. Territories range from about 20-50 km2, 7. Clouded leopards are sexually mature around the age of 2 years. Mating can occur in any month, but in captivity most breeding occurs between December and March. The gestation period is 85 to 93 days long with 1 to 5 cubs per litter, although 2 is the most common number. Females can produce a litter every year. Cubs become independent at approximately 10 months of age. In captivity, clouded leopards present a reproductive challenge. Unfortunately, there is a high incidence of aggression between males and females, sometimes resulting in the death of the female. This has made clouded leopards one of the most difficult cats to breed in captivity. Present captive management practices include introducing the members of a pair prior to one year of age. This practice has resulted in the establishment of more successful pair-bonds and lessening of aggression. Like many animals in captivity, cubs are often hand-raised by keepers, rather than the mother. This depends on the temperament of the mother, the institution's facilities for newborns, and the health of the babies. More detailed information can be read in the Clouded Leopard Babies section. 2 Buckley-Beason VA, Johnson WE, Nash WG, Stanyon R, Menninger JC, Driscoll CA et al. : Molecular evidence for species-level distinction in modern clouded leopards (Neofelis nebulosa). Current Biology, in press. 6 Gordon, C. H. and A. E. Stewart (2007). The Use of Logging Roads by Clouded Leopards. Cat News 47: 12-13.